Last week I traveled to the emirate of Sharjah to attend the first Women’s Leadership and Technology Conference. The event brought together women leaders from the region to talk about how they were using technology to engage local communities.Â Despite unheard of rain and flooding (this is the desert, after all) I had a lot of fun. To determine which social media tool is right for your campaign you need to start with your advocacy goal, identify a target audience, and then determine the most effective means of reaching that audience, based on where their attention is and what platforms you have access to. 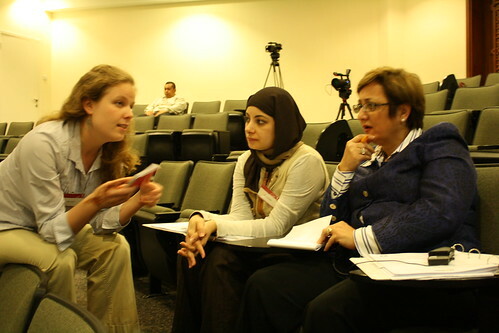 Talking to participants from Kuwait and Lebanon about their social media choices. 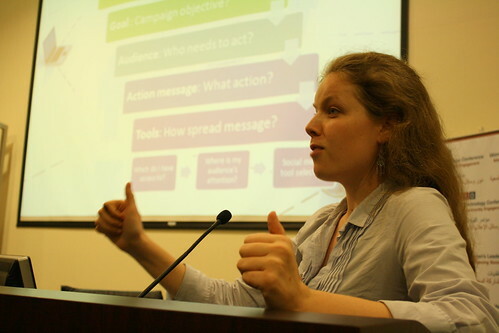 The training module started with a presentation of the strategic framework (above) and then asked participants to make selections about the appropriate social media tool given their own strategic context. 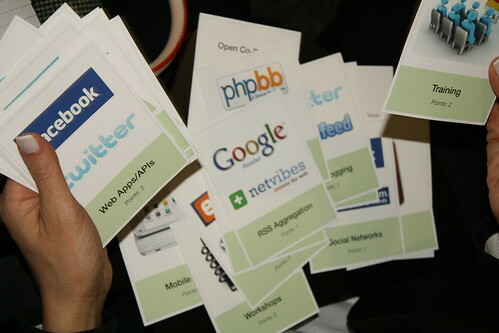 To give them a better idea of the possibilities, each group was given a deck of both digital (Google Docs) and non-digital (events) tools to use in their campaign.Â The participants were given a tool “budget” meaning they had to select a limited number of tools and defend why each tool made sense in their particular campaign context. At the end of the module, groups shared their social media selections, and did a really great job of showingÂ linkages between advocacy goal and tools.Â I’d like to do this module again some time.